By using the Tooltip.js plugin of Bootstrap framework, you may create tooltips for different elements like buttons, links, text boxes etc. quite easily. I will show you how to create simple and customized tooltips with online examples in this tutorial. You may click on any image or link below the image for seeing the live demos. In this demo, a tooltip is attached to a button that uses the Bootstrap class. See this online which is followed by how to create it. You have to include the jQuery library as well to call the tooltips along with Bootstrap CSS and JS libraries. By default, the direction of the tooltip is on top of the element. You may set the direction by using the placement option in the script section. See the next example that used placement option. The title attribute of the element, in that case, a button, is used as the tooltip text. By default, the tooltip background color is black with white text. In this demo, four buttons are used to show the tooltips in all directions i.e. top, bottom, left and right. Until now, you have seen only default tooltip styles as set in the Bootstrap CSS. By overriding the tooltip classes, you may customize the look of tooltips as per need or to match the website theme. 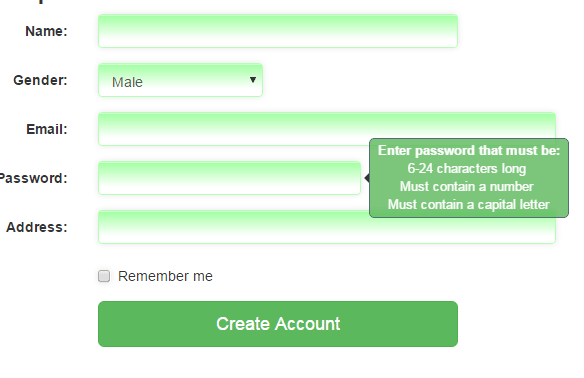 Following are a few examples of Bootstrap tooltip customization. In this demo, each direction i.e. top, bottom, left and right are given different background colors. The tooltips are attached to button elements. Following classes are used for each direction. There are a few other classes as well to manage arrows or other properties. Have a look at the style tag in the head section in the demo page. Moreover, you may add HTML elements like h1 heading, paragraphs, links, images etc. in Bootstrap tooltips. So what is done there? 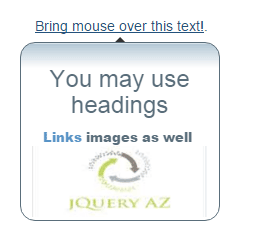 I simply used HTML tags for the link, heading and image inside the title of a link that shows a tooltip. The same custom CSS is used to style the tooltip borders, background etc. as in the above example (See style section). That’s it! An HTML tooltip in Bootstrap forms is shown below with more details. The final demo is to show custom tooltips in Bootstrap form. As you enter the cursor or bring the mouse over a textbox, it will show a tooltip attached to it. You may use different HTML tags there to display tooltips.